Left to right: Carol Susan Reshetiloff, President of Annapolis Civitan Club, Providence Center CEO Chuck Coble, Mike Ragland, Annapolis Civitan Club Secretary, and Shin Chang Huand, President-Elect of Annapolis Civitan Club. 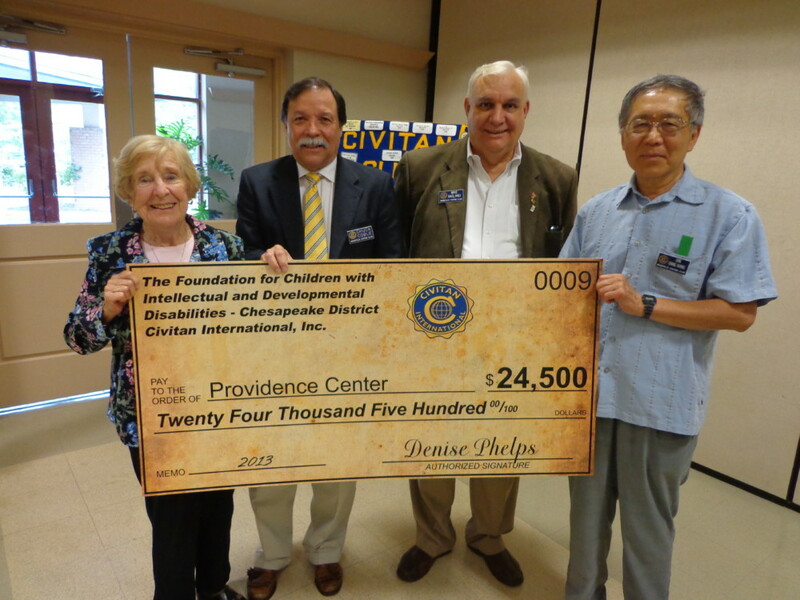 Providence Center, a non-profit organization that serves adults with developmental disabilities, announced today that it has received a $24,500 grant from the Civitan Foundation for Children with Intellectual and Developmental Disabilities – Chesapeake District Civitan International Inc. The grant was presented by the Annapolis Civitan Club at its bimonthly meeting on Thursday, May 16, 2013. The grant is for the purchase of sensory room equipment for Providence Center’s Jean Bradbury Building in Arnold, which is currently being renovated to make it a state-of-the-art program site for adults with developmental disabilities. The grant was awarded with the support of and contributions from the Glen Burnie Civitan Club and Annapolis Civitan Club. It will be used to purchase equipment that benefits Providence Center’s participants that are non ambulatory, seniors with dementia, and those with autism, among other users. The Civitans also provided the sensory room equipment for the organization’s clients at its Cloverleaf site in Millersville. Sensory rooms are a proven therapeutic and educational tool for those with disabilities. They assist those that are most vulnerable, non-verbal, and/or non-ambulatory. The technology provides cutting edge therapy to greatly enhance the ability to feel, see, and experience the world as well as make choices for themselves which they often are not able to do. It is a multi-sensory environment that uses fiber optic lights, sounds, textures, and aromas to exercise one’s senses to their fullest potential. It also provides a place to relax. This is especially important for those who are over-stimulated or wheelchair bound. In 2008, the Civitans funded a similar sensory room at Providence Center’s Millersville location. The organization reported the positive changes in behavior, improved task concentration, and an increase in a variety of skills such as awareness of self, social interaction behaviors, communication, and exploration and manipulation of stimuli in those clients that regularly use the equipment. The Jean Bradbury site has more than 80 participants with autism, visual impairments, cerebral palsy, hypersensitive disorders, and challenging behaviors that will benefit from the sensory room. Providence Center, a non-profit organization based in Anne Arundel County, operates four program sites which provide care and training in programs such as Supported Employment, Horticulture, Woodshop, and Pottery throughout the county. It meets the growing needs of nearly 500 individuals through an array of services and supports, including medical, job preparedness and training, mentoring, production, employment coaching, senior care, and day habilitation.